November is National COPD Awareness Month so I thought it would be nice to share some numbers pertaining to this devastating chronic disease. 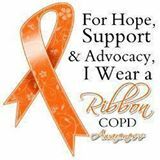 In my state alone a survey taken in 2011 showed that 6.2 percent of the people over 18 in our state have been diagnosed with COPD (Chronic Obstructive Pulmonary Disease). In some areas where individuals with low income and education levels the impact seems to be even greater. Did you know that COPD has a $49.9 billion annual economic impact cost of COPD (costs of ER visits, hospital stays, lost productivity). There are approximately 13.1 million people diagnosed with COPD with another 12.0 million undiagnosed). Of those living with COPD, 51% say it limits any ability to work and 53% say it limits any kind of social activities. Many Americans who have COPD do not or will not discuss their symptoms until they have already reached a severe stage of this progressive, irreversible and seemingly invisible disease. Many living with COPD have made a self-diagnose of their symptoms by putting it on aging, allergies or a normal result of tobacco use for why they may be having difficulties with breathing. Without a true medical diagnosis – individuals do not or will not take the steps to modify risk factors and appropriately manage their condition. Even though people with COPD face many challenges, there are tremendous opportunities to improve the lives of our residents while also saving the state and healthcare systems money through improved outcomes. Unlike other high-mortality diseases, COPD does not receive federal categorical funding for public health initiatives at the state level. The successes achieved in lowering the mortality associated with other devastating diseases have not occurred for COPD, which means we all need to work together. Now, more than ever before, we all have a chance to help the COPD Community by integrating COPD into ongoing chronic disease activities such as the coordinated chronic disease state plan. I am simply asking for you to raise your awareness about this debilitating disease and to become more understanding with those around you that may be suffering from it, including yourself. Speak up, step out and most of all educate. Breathe well – Live Well – Live Long.